Until a few days ago, I thought of popsicles merely as a kids' summertime treat - basically just colored sugar water that tastes really good when it's hot outside. Then I came across two popsicle recipes that will forever change the way I look at popsicles. One is basically a cocktail on a stick; the other is an innovative way to get your kids (or yourself) to eat a healthy breakfast or snack. When I saw Giada DeLaurentis make *these* watermelon vodka popsicles on her show, I just had to try them. Unfortunately I decided to make them for a BBQ we were attending later that day, failing to notice the part of the recipe where it says they need to freeze at least 10 hours or overnight. Oops. So we didn't have watermelon vodka popsicles that day, but we did have watermelon vodka slush, which was probably just as good. And when I stirred some of the slush into the lemonade/citrus vodka drink my friend had made...heaven! My husband wasn't a fan of the mint, but it probably can be eliminated or maybe replaced with a tamer herb - like basil?? I'm thinking some cucumber could even be thrown in to cut the sweetness. A few days ago, I stumbled across *this* blog post about serving popsicles for breakfast. After my recent breakfast cookie experiment, I was excited to find another fun way to serve healthy foods for breakfast. I haven't had a chance to make these yet, but my mind has been swimming with possibilities - especially since I recently discovered an amazing non-dairy beverage that tastes like drinkable strawberry yogurt and would probably be perfect in this recipe. To further my excitement about popsicles, I saw *this* awesome popsicle mold on the front of the Williams-Sonoma catalog. Basically you keep it in the freezer, and it will freeze a popsicle in 7 minutes. So that would eliminate the whole "oops - I forgot to wait 10 hours" thing. It's a little pricey at $50, but if my popsicle obsession becomes full-blown, I may just have to spring for one. I am totally gonna do that... my kids love smoothies ... although the amount they drink varies I but they would eat more of a popsicle... and the green ingredients are great! Johnny likes putting flax seed and wheat germ in his I think it a bit gritty but in a popsicle may not notice it... hmmm I am gonna have to stop by walmart to get some molds! My problem is that I don't have the patience to eat a popsicle, and my teeth are sensitive and can't handle biting into cold things. 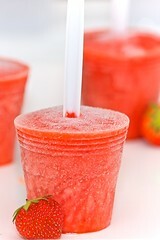 The vodka watermelon slush, though, sounds awesome. Love the idea, nothing better than homemade Popsicles. I like being able to control what goes into them. I like your idea of the cups you used, not something I had thought of using. Would work great for my grand kids who are definitely messy eaters.